Tonight: Jim Wright of the Meadowlands Commission and Don Torino of Bergen County Audubon will be on the cable-TV news show, NBC New York Nonstop with Chuck Scarborough. The program airs live at 7 p.m. We should be on after 7:25 for a minute or two. Butterfly Day Is On for Sunday! We are going ahead as planned for Sunday's Butterfly Day at DeKorte Park. Temperatures are supposed to be around 90 degrees but the forecast is otherwise promising. The MEC is air-conditioned, and it has a couple of water fountains. Bottled water will also be for sale, but you are welcome to bring your beverages, lunch and sun block. Schedule of events is here. Feel free to check the blog for updates — they will be posted at the top of the page. Thank you! 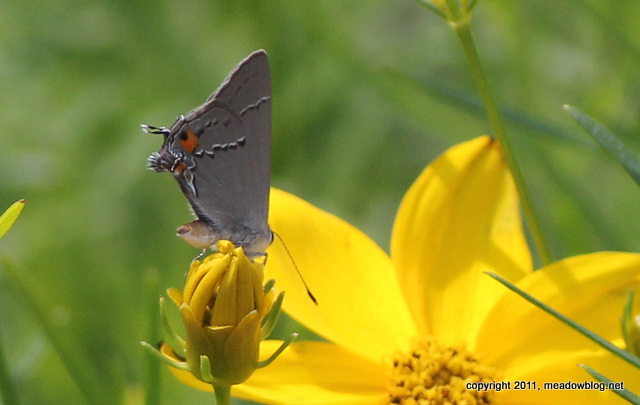 With the prolonged heat wave, butterfly sightings seem to fluctuate, but we had a good morning yesterday, with a first-of-the-season (for us) Gray Hairstreak (above) sharing some Coreopsis with two Pearl Crescents. Also had a Viceroy and a Clear-winged Moth, plus assorted skippers and Cabbage Whites. We are hoping to have some good butterflies on Sunday for Butterfly Day. 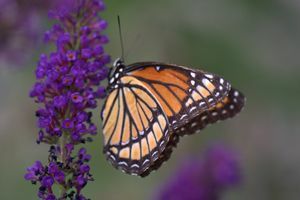 Click here for more on the schedule for this free, family-friendly event brought to you by the New Jersey Meadowlands Commission, Bergen Country Audubon Society, and the Northern New Jersey chapter of the North American Butterfly Association. You can't really tell from the photo how big this bug is, but it is one huge wasp with an amazing reproduction strategy. 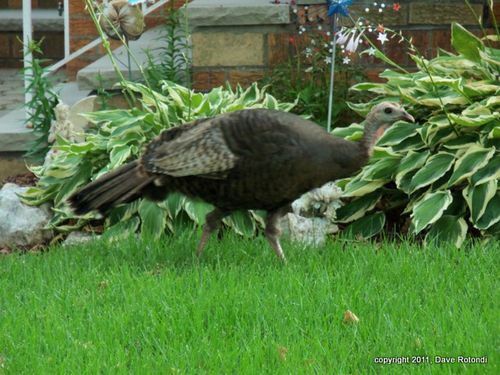 By the way, they live less than two months as adults and rarely sting humans. Seen yesterday near the Butterfly Garden and in Harrier Meadow. Oh, yes — the amazing reproductive strategy. 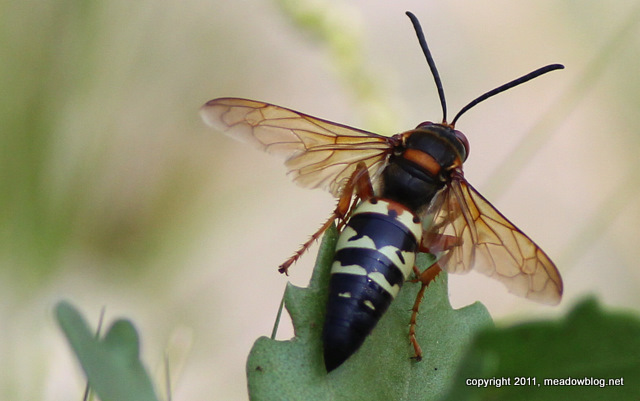 The female paralyzes Cicadas, lays her eggs inside, and then buries them. More on Ciacada Killers here.